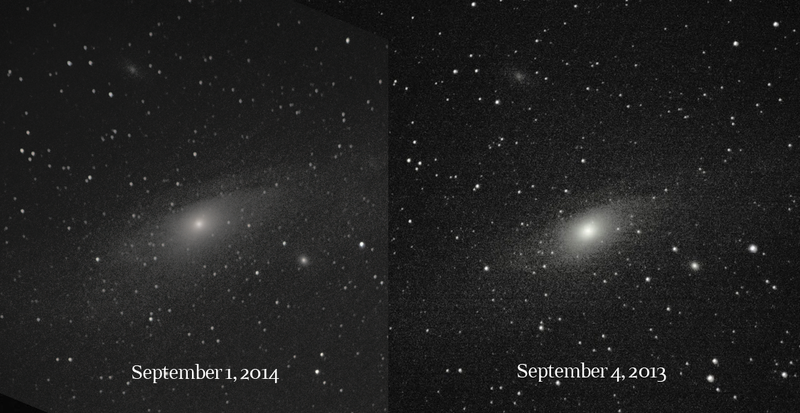 I haven't done a good Andromeda attempt since 'Andromeda Season' kicked off last year in September. At that point, I made incremental baby steps to finally visualize some dark dust trails in the spiral arms of our galactic neighbor. Last year I was reaching the upper limit of what I could do with a fixed tripod - which limits me to 1.3 sec exposures at 300mm. I got the Orion EQ-1 mount last Christmas, but I didn't really get to USE it, I did try setting it up once on my balcony but I was nervous about dropping screws through the floorboards. I was trying to figure out how to slew the camera to the right position in the sky without unhooking and re-attaching the motor. It is delicate and uses a tiny hex screw to attach to the gear wormscrew attachment thinggy. Was I seriously expected to slew to the right spot, and then unhook the manual knob and replace it with the motor out in the field?? I avoided using it until I had my own place to really sit down and figure it out. While I was setting up last night, I noticed the thumb screws on the mount - and I tried loosening them to slew without unhooking the motor. It worked! This might seem obvious, but to a self-taught amateur this was the secret that made the setup a lot more user-friendly... I'm much more likely to use the EQ-1 mount now that I know I can leave the motor attached while I slew to the approximate location. I set up on the front walkway with a kitchen chair. I did a rough polar alignment - I still need to figure out a good way to align correctly with a camera since I don't have a finder scope (and really good alignment was never important before with just observing manually). 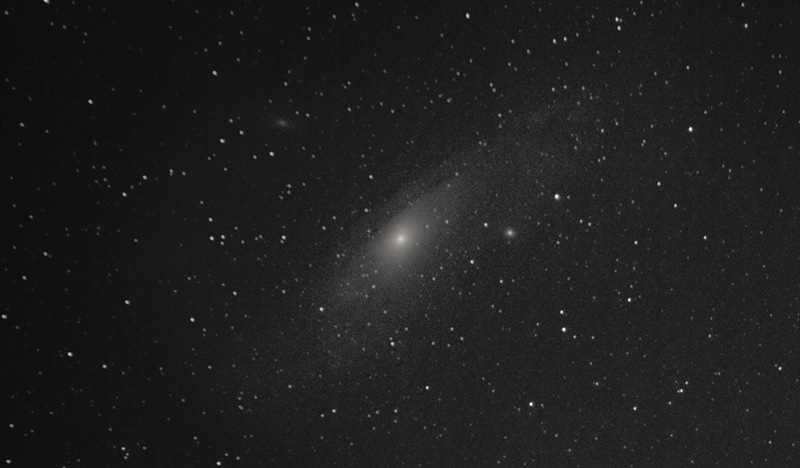 After aligning to Polaris, I loosened the thumbscrews and slewed toward Andromeda. I found it easy enough because I've been observing it for a couple years now. I did a test shot of 15 seconds at ISO 1600 and found that not only was I getting some small trails but the light pollution was washing out the photo. I pulled back to 13 seconds and the trails were insignificant. This is a pretty crappy polar alignment but WAY more light gathering potential compared to 1.3 second frames! I took a quick stack and then noticed clouds getting in the way. 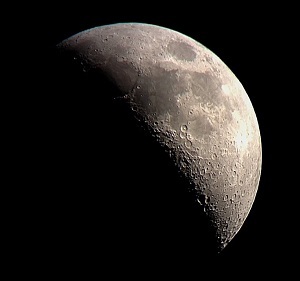 I waited a little bit and then played with ISO 800 for 13 sec to see what that would look like. I took some dark and bias frames and stacked in Deep Sky Stacker this morning.